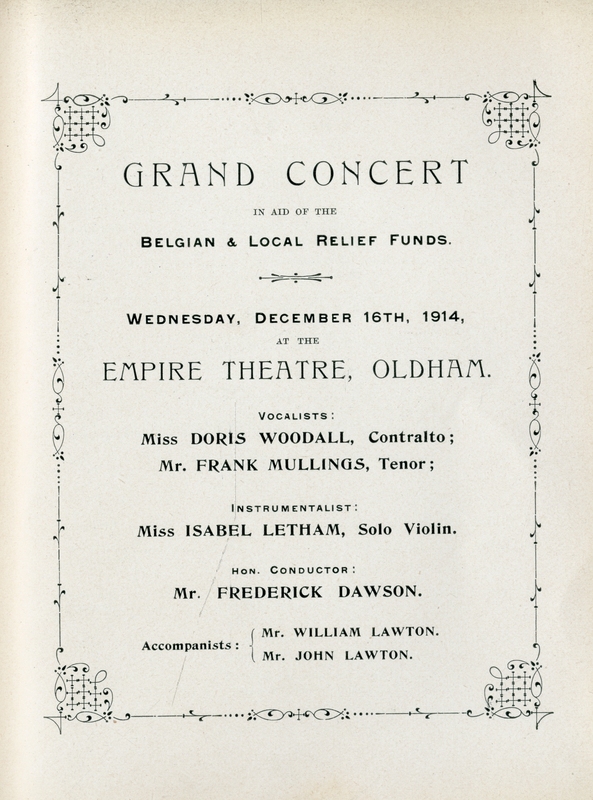 From the archive at Oldham, comes this story of a concert for Belgian refugees. 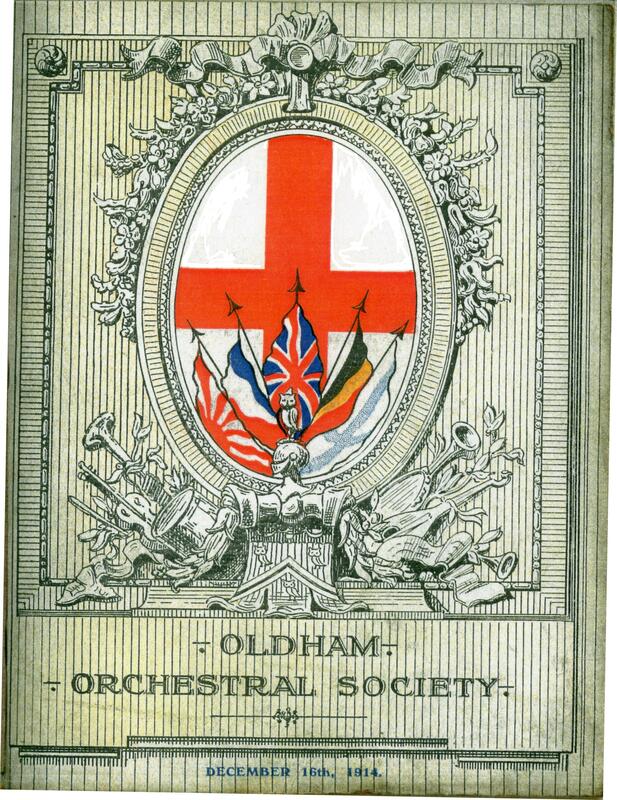 On 16 December 1914 the Oldham Orchestral Society played at a Grand Concert in aid of the Belgian and local relief funds. The concert included works by English composers Granville Bantock, Percy Grainger, S Coleridge Taylor, the Russian composer Tchaikovsky, and perhaps surprisingly the German composers Beethoven, Max Bruch and Wagner. On Wednesday evening the Oldham Orchestral Society gave a concert at the Empire Theatre in aid of the Belgian and local relief funds and from the artistic and financial points of view the occasion was very successful. The theatre was not quite full, but there was a large audience, the splendid sweep of the dress circle presenting a very attractive appearance with the evening dress. The Mayor and Mayoress had seats in the centre of the front row of the circle and Mrs. Alderman Lees had a party in one of the boxes. The orchestra was for this occasion without professional leader, Mr. Frank Jagger having the honour for this concert, and Mr. Frederick Dawson, the honorary conductor, held the baton and the orchestral contributions to the evening’s programme were completely successful. Possibly the most beautiful of these was the mellifluous Berceuse from Goddard’s ‘Jocelyn’ for strings, woodwind and with a horn solo tastefully played by Mr. W. Hilton. 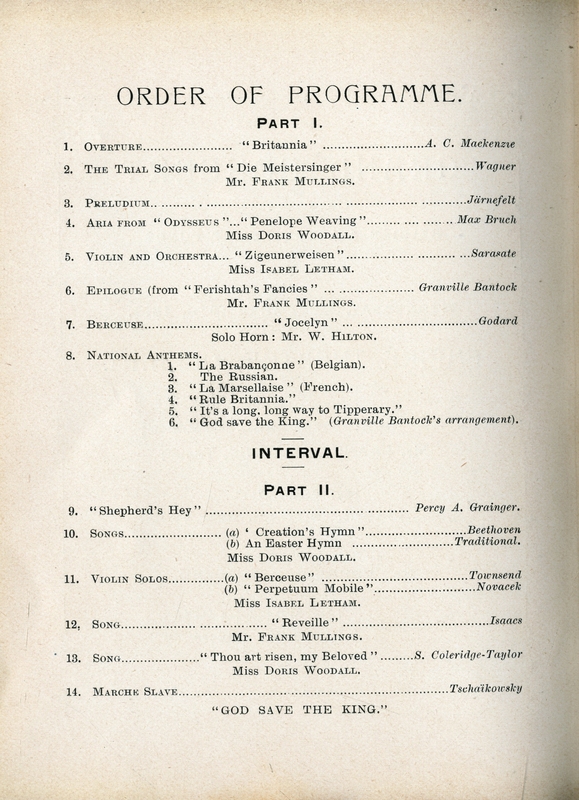 A very popular mood was adopted in the treatment of the set of national songs with which the first part of the programme was wound up. The item was entitled ’National Anthems’ and was described as Granville Bantock’s arrangement, but we may be pardoned for suggesting that that despite its popularity and its aid to the marching powers of our soldiers it is yet too early to canonise ‘It’s a Long Way to Tipperary’ as a ‘national anthem’. However, the large audience jumped at the chance to sing the lifting, swinging chorus when its turn came. The printed appeal to any Belgians present to sing ‘La Brabanconne’ in Flemish did not elicit any audible response, and the English words printed on the programme seemed to be impossible to fit in with the rhythm of the tune, and the result was that the Belgian anthem was left to the band. The cover design of the programme was by Monsieur Paul Stordiau, architect of Antwerp, who is at present a refugee in Oldham. The inclusion of ‘It’s a Long Way to Tipperary’ in the performance of National Anthems shows how iconic the song had become by this early stage in the war. Allegedly written in Stalybridge in 1912 it was taken up by the British Expeditionary force in France and achieved world-wide popularity after being sung in a pantomime in November 1914 by the music-hall star Florrie Forde.